When using a chassis dynamometer, brake tester, etc. to perform a vehicle test, activate test mode to avoid a "different tire diameter installed" incorrect judgment. Test mode does not have a AWD parameter. Test mode is activated because it will prohibit a different tire diameter judgment. Different tire diameter malfunction judgement (detection that tire diameter of all wheels are not same) is not performed. Activate test mode before using a chassis dynamometer, brake tester, etc. to perform a vehicle test. (b) Use either of the following methods to change the AWD control ECU to test mode. Connect the Techstream to the DLC3 connector and turn the ignition switch to ON. Using the test mode activation function (mode 10), activate test mode. With the ignition switch off, connect the TS and CG terminals of the DLC3 connector. Then turn the ignition switch to ON to activate test mode. When the ignition switch is turned from off to ON, the AWD warning light will illuminate for 4 seconds. Then it will turn off. 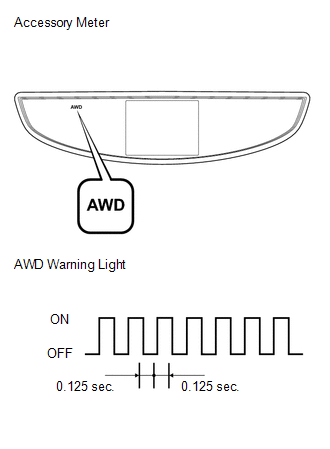 If a part of the active torque control 4WD system has a defect, the AWD warning light will illuminate. (c) Check if the AWD warning light has changed to the test mode display.